On 30th Street in Boulder, CO there is a sculpture of a man chiseling himself out of a block of stone. The mans head, torso, arms, and thighs have already been carved from the stone. His right hand holds a hammer above his head ready to strike a chisel he grasps in his left hand. He is forming his right knee. Am I a self-made person? Am I as autonomous as I can (want to) be? Am I self-responsible and can I self-manage? Am I moving forward in my life? Am I a continuous learner? How am I creating my life? This sculpture represents both the present state and potential of a self-made, self-actualized person. Too, the sculpture points to the complexity of emotion, struggles and triumphs of life. Each of us has a choice as to how we use our innate talents to be productive and creative in our lives at work, at home, and at play and whether and how we will move through the challenges, road blocks, bumps in the road and other obstacles that might stand in the way of our personal and professional growth, development and evolution. 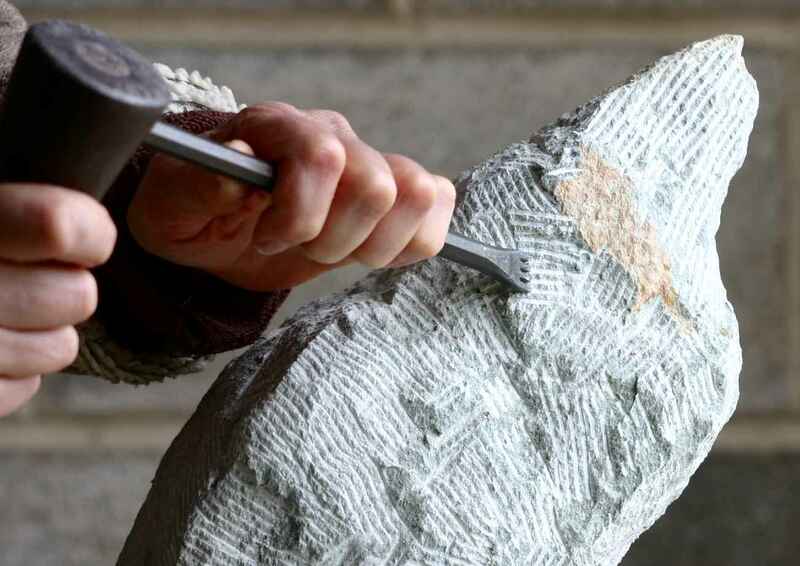 That is, how we chisel our sculpture. So, I would offer that you take some time today, tonight, this week or weekend and reflect upon your sculpture as it exists right now. How are you creating your self, developing your self, and actualizing your self at work (at home and at play)? Is your sculpture the same sculpture today as it was last week, last month, last year, three years ago, five years ago, ten years ago, twenty years ago? Have you stopped chiseling? And if so, when and why? Or, have you been consistently chiseling? For some of us, the block of stone represents stuckness, i.e., immovability, motionless-ness, fixedness, the status quo, and being dead in the water, a destination. For others, the block of stone represents potential, i.e., possibility, creativity, self-actualization, capacity and becoming, a journey. What does your sculpture say about you? Does my sculpture reflect conscious life choices personal, professional, relational, spiritual, etc. that have resulted in furthering my growth and self-actualization, and supported me to grow in a positive way, or choices that keep me lifeless, static and in a no-growth state? Does my sculpture reflect an honest, sincere and self-responsible effort to take care of my mind, my body, and my heart? Does my sculpture reflect conscious efforts to be a more effective and supportive leader, manager, supervisor, co-worker, partner, spouse and friend? Does my sculpture manifest positive qualities that reflect, for example, my core values, integrity and authenticity, being a better listener, being empathic and compassionate, being more patient, being more accepting and understanding, being more focused, being a better delegator, being more humorous, being more proactive, or being more financially responsible? Does my sculpture reflect self-responsibility and accountability vis–vis my living space and working environment? Does my sculpture reflect my conscious efforts to improve the quality of others lives? Some people spend the first half of their lives saying how they intend to chisel their sculpture and the second half of their lives explaining why they couldn’t do it. How about you? Are you investing your time and energy chiseling? Or spending your time and energy explaining why not? Wherever you are with your sculpture, it will become your legacy. Folks will judge you by what they see. How are you choosing to sculpt your block of stone, your “you’? · What one simple baby step can I take this week to chisel one small piece of my stone that will result in a healthier, more self-responsible, more honest, more sincere, more positive and more creative life at work, at home and at play? · Am I a continuous learner, a lifelong learner, a “work in progress”? · Has my chisel dulled? What can I do to re-sharpen it? Do I have the strength to lift my hammer? · Looking from afar, how would I describe my sculpture? How would others describe my sculpture? · Do I like my sculpture? · Have I stopped chiseling?